It’s Halloween weekend, and time to look back at a show that typifies that spirit. Not just the strange and somewhat paranormal, but also the kids’ trick-or-treat fun of the experience. Eerie, Indiana was both at the same time. 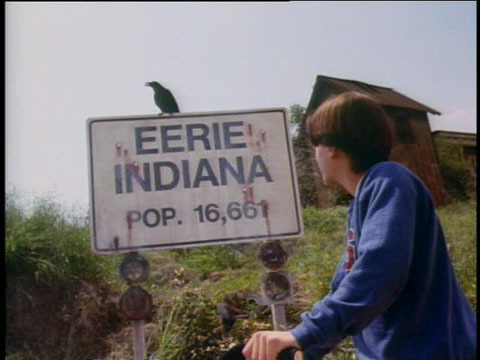 "There's the signpost up ahead..."
Premiering on NBC in the Fall of 1991, Eerie, Indiana was sold to the network as the “family” version of the previous season’s big hit, the mysteriously odd Twin Peaks. Airing on Sunday nights in the “family hour”, the show really was a kid’s Twilight Zone, with a continuing cast instead of an anthology format. The show took place in the quirky, off-kilter town of Eerie, Indiana (which we find out, from the air, is shaped like the Bermuda Triangle). The plots ranged from scary to sweet to heartbreaking, just like the original Twilight Zone. But it seemed that the only people in the town who were aware of the strange goings-on were best friends and neighbors Marshall Teller (Omri Katz) and Simon Holmes (Justin Shenkarow). Whatever sense of normalcy exists is provided by Marshall’s family. But even their lives are occasionally touched by the strangeness of the town, whether it’s father Edgar (Francis Guinan) developing a computer “personality” program for an ATM that decides to give all the town’s money to Simon, or mom Marylin (Mary-Margaret Humes) being “adopted” forcefully by someone trying to create the perfect family for themselves. And although sister Syndi (Julie Condra) can sometimes be the bane of Marshall’s existence (as most sister/brother relationships can be in the teen-age years), she hopes to someday be a reporter, edits the school newspaper, and occasionally helps Marshall with information, even though she is unaware of its connection to the fantastic things Marshall and Simon encounter. Eerie's Simon and Marshall face the weird. Marshall and Simon’s adventures included everything from a trip through a time warp to encountering a storm-chaser obsessed with a “recurring” tornado, a la Captain Ahab. They fought off werewolves and a mummy that had been transported out of a horror movie. They helped long-lost loves to reunite, even beyond death. Although they tried to convince the rest of Marshall’s family that something wasn’t quite right, the boys remained the only ones who were aware of the wild, wonderful, and weird occurrences going on in their town. I mean, Tupperware is good for preserving food, but will ForeverWare actually keep your entire family from aging a single day? Just make sure you burp the lid when you say good-night to your kids and tuck them in their giant plastic containers at bedtime… yes, this was definitely Eerie…. Also in the second half of the season, another character was introduced named Dash X (Jason Marsden). This “grey-haired kid” also seemed to be aware of the strangeness going on in town, and probably rightfully so. His odd name was taken from the unusual marks on his hands, and it was hinted that he might actually be, at least in part, of alien origin. Dash brought even more unpredictability to an already unpredictable presentation, and served as a continuing storyline tying together the series mythology. One of the formative creative minds behind the show was Joe Dante. Known for his quirky body of work, Dante has directed the Gremlins movies, Innerspace, TV episodes of The Twilight Zone (1985 revival), and a rather unusual episode of CSI:NY. As a creative consultant from the beginning of the series, his whimsical style and unique take on storytelling was vital in the development of Eerie, Indiana. He even took part in the final aired episode, not only directing, but appearing in it. The episode, entitled Reality Takes a Holiday, turned the series on its ear by putting Marshall into one of the strangest worlds possible: Hollywood. Dante played the director of a show that was similar to Eerie, and Marshall had to literally “rewrite the script” in order to return to his “home”, stop Dash X from becoming the star, and being completely replaced in every reality. Other actors loved the idea of working with Dante and the wonderfully creative atmosphere of the show, and the guest list included then-current and future stars like Tobey Maguire (playing a ghost seeking his long-lost love), the wonderful Matt Frewer (as the tornado obsessed scientist), and Ray Walston (whose My Favorite Martian series was comedic inspiration to a young Dante). The show’s inventiveness and anything-can-happen feeling allowed actors, directors, and writers to stretch their creativity beyond anything on a normal television show, and although occasionally limited by budgets, Eerie, Indiana had no scarcity of storytelling imagination. The show had, unfortunately, a scarcity of viewers, ranking 94th in the ratings, ahead of only four shows on the entire TV landscape that fall. It aired in the impossible time slot of Sunday nights at 7:30/6:30 Central and it was up against the #1 show on television at the time, 60 Minutes. It also had a habit of being delayed by NFL Football broadcasts, and its lead-in was the eminently forgettable The Adventures of Mark and Brian, about two LA disc-jockeys and their supposedly wild and wacky adventures (which were neither wild nor wacky, and not even particularly interesting). The show may as well have been in a Twilight Zone of its own, with these challenges to face in attracting an audience. If Eerie, Indiana had aired a year later, it might have developed a true following, instead of becoming just a cult favorite. The first books in the Goosebumps series by R. L. Stine appeared a few months after the cancellation of the series, and jump-started the “youth-horror” genre, leading to shows like Nickelodeon’s successful Are You Afraid of the Dark? 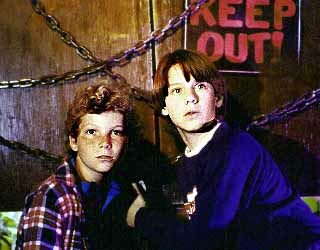 The original series was soon repeated on the Disney Channel (including the single unaired episode), and a short-lived sequel called Eerie, Indiana: The Other Dimension was broadcast for a season on the FoxKids network in 1998. Seventeen “young-adult” books were also published to coincide with the sequel, but strangely, they featured the characters of the original show, and not those of the new series. Dimension was really Eerie in name only (although there’s a brief bit in the sequel pilot episode, called Switching Channels, which indirectly links it with the original). There was more emphasis on gentle frights and less on invention, and with both budget and creativity lacking, Dimension died a quick and deserved death. But the original Eerie, Indiana is still remembered as a fun, strange, and family-friendly approach to telling Twilight Zone-type stories from a young teen’s point of view. OMRI KATZ (Marshall Teller) started acting at the age of 3 in television commercials. He’s best known (besides Eerie) for playing J.R. Ewing’s son, John Ross, on Dallas, and being chased by comical witches in the Disney movie Hocus Pocus. He’s now retired from acting and has moved to Israel, where his parents were born and where he’d spent a year of his youth. JUSTIN SHENKAROW (Simon Holmes) spent four seasons as a regular on Picket Fences as middle child Matthew Brock, and has had an extensive career doing voice-over work for animated series such as Life with Louie, Recess, and Hey, Arnold! Justin was also elected to the board of the Screen Actors Guild, and most recently was featured as himself in the reality series Millionaire Matchmaker. FRANCIS GUINAN (Edgar Teller) has acted in television, movies and on Broadway. His television appearances include guest roles in two different Star Trek series (Voyager and Enterprise) and two different CSI series (Miami and NY), among many other shows. On Broadway, he appeared in a featured role in the 2008 Pulitzer and Tony Award winning August: Osage County, and was most recently seen on the movie screen as Master Pakku in M. Night Shyamalan’s The Last Airbender. MARY-MARGARET HUMES (Marilyn Teller) had her highest profile role as another mom, this time of the title character on the WB hit Dawson’s Creek. A former beauty queen and runner-up in the Miss USA pageant, she got her first significant acting job by advertising on a Hollywood billboard seen by Mel Brooks, who cast her in History of the World, Part I. Numerous guest TV appearances followed, most recently in Grey’s Anatomy, Criminal Minds, and Saving Grace. JULIE CONDRA (Syndi Teller) went to Hollywood after a short modeling career, landing roles in The Wonder Years, the soap opera Santa Barbara, and Parker Lewis Can’t Lose (ironically leaving a regular role in that series for Eerie, which was then scheduled directly opposite Parker). She appeared in the movie Crying Freedom, where she met her husband Mark Dacascos, actor, martial arts champion, and host of Iron Chef: America. They have three children. JOHN ASTIN (Mr. Radford) is a hero to fans of quirky and strange everywhere, and has been featured on this blog previously for his role in Brisco County Jr. While best known for his roles in The Addams Family and Night Court, his early cult comedy I’m Dickens, He’s Fenster will be coming out on DVD early in 2011, and therefore he will probably make yet another appearance here soon thereafter. 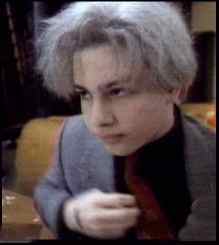 JASON MARSDEN (Dash X) got his start on the soap General Hospital, and had his first brush with weird playing Eddie Munster in the 1988 series The Munsters Today. After Eerie, he landed recurring roles on many of ABC’s T.G.I.F. series, including Full House, Step by Step, and Boy Meets World. He’s had a huge career in voice-over acting, in roughly 50 different animated movies and series. Also a director and a producer, his many activities are featured on his website, That Guy From That Show. The complete series of Eerie, Indiana is available on DVD, but be aware that there are also 3-episode sets out there, if you want just a particular episode or representative sample. Although the books based on the show are out of print, titles can still be found through secondary agents such as the many online used bookstores, sometimes for as little as a dollar per book. The entire series (including the unaired episode The Broken Record) is available for streaming at Hulu. There’s also a wonderful in-depth examination of the series-twisting episode Reality Takes a Holiday online, for those desiring more behind-the-scenes information (just ignore the comments there, as there are some very rude people who wish to make more complaints about the ads on the site than discuss the story). If you have youngsters at home, I highly recommend that you expose them to this wonderful series as a lighter way to celebrate the traditions of Halloween without the macabre or occult aspects. And then, later, they can segue into the wonder of Eerie‘s obvious inspiration, Rod Serling’s legendary Twilight Zone. –series writer Michael Cassutt, who’s also written for The Twilight Zone (1985), Strange Luck, Stargate SG-1, and Farscape, among many others. I think humor is one thing that people forget about in some of the original Twilight Zone episodes, and it is one of the elements that made Eerie, Indiana not just family-friendly, but gave it a spirit that wasn’t just about frights and strangeness. It gave it heart, and wonder, and whimsy as well. And although much of Halloween portrayed in movies and TV now focuses on horror and fear, there’s still the magic of kids playing pretend, of gentle bumps-in-the-night, and the celebration of weird instead of just running from the monster. Eerie, Indiana definitely captured that spirit of the season, and although you can’t find it on any road map these days, it still has a place on the map of imagination. There’s the signpost up ahead… Eerie, Indiana, just a normal little suburb somewhere near The Twilight Zone. Oh, and if you happen to stop by someday, say hi to Elvis for me…. he’s on Marshall’s paper route. Aired at Friday 8/7 Central? That might have been a blessing, instead of being sentenced to the Sunday 7:30/6:30 slot it aired in. For once, the “death slot” on Friday may have helped it find an audience that would have appreciated it.